We manufacture & offer Painted Wooden Boxes in many sizes & metal work designs.The Wooden Boxes are also available in Sets of three. Polished box made of MDF board with 8 inner chambers, lid fitted with hinges and latch clip. Printing as per design. To be used for tea and other gifting purposes. We manufacture Decorative Wooden Boxes in Indian Rosewood Or Mango Wood.We can manufacture Carved Wooden Boxes strictly as per buyers specifications. Indian Hand painted wooden box set. 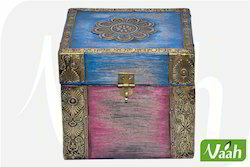 Wooden Painted Box Set are manufactured and painted by our expert team. We are using the high grade of wood and color to design our products. We are providing these products in different sizes and we also modify them according to the needs of our clients. Our products are corrosion and termites free as they are polished with spirits. These products are offered in market leading price. We are successfully engaged in providing a wide gamut of Madhubani Painted Wooden Tissue Box. Owing to the years of industrial experience, we have been able to serve our dear clients with a wide array of PaintedWooden Tissue Box. These tissue boxes are correctly manufactured to gain the utmost satisfaction of clients. 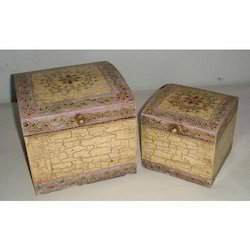 Painted Box highly splendid and mesmerizing wood painted box is an exclusive gift for sweetheart. Our designers have poured their heart out by enhancing the looks of these boxes with a plethora of colored patterns. We manufacture these boxes from top quality wood, which signifies our pursuance to excel and grow in the market.